When you think about your classroom routines and your teaching methods, what three techniques are your go-to options? Maybe it's interactive notebooks, anchor charts, and Daily Five? 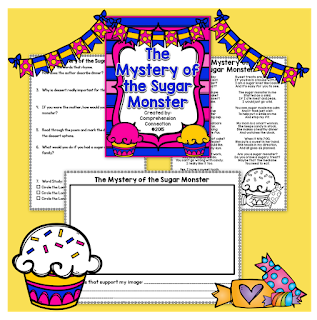 or Maybe you love Close Reading, Mentor Texts, and Centers? I'd like to propose that you poetry notebooks into your daily routine. Poetry month may be in April, but poetry needs to be part of your routine every..single...week, period. Why? 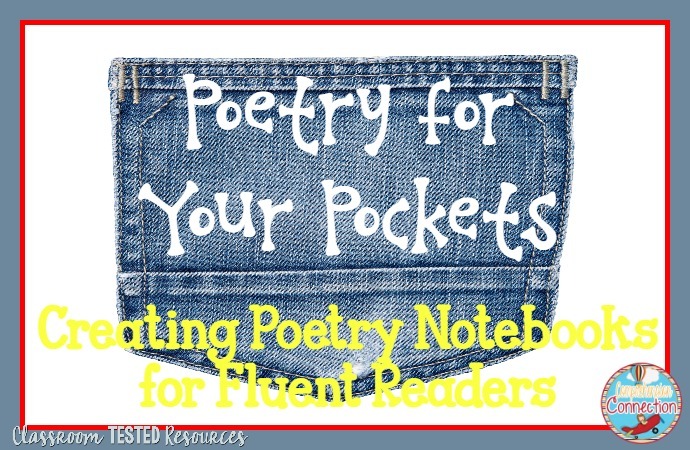 Well, in my opinion, poems are short and easy to use during those 15 minute blocks you might use as "filler" time, and yet, you can pack in so many skills in a very short time, and if you keep them in page protectors in a small binder, students can revisit them over and over again for different purposes that all help build readers. First of all, you can work with your students on developing fluency. With my students, I model phrasing by either color coding or using slash marks. You can see in the picture both options. 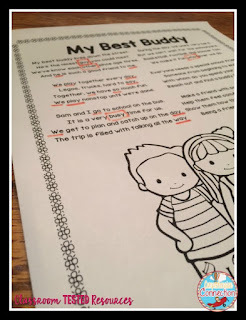 With color coding, you can pair students and alternate phrases. The important thing with these lessons is to tell students that there isn't just one way to phrase a poem. Readers need to phrase the lines in a way that sounds like talking and is comfortable. 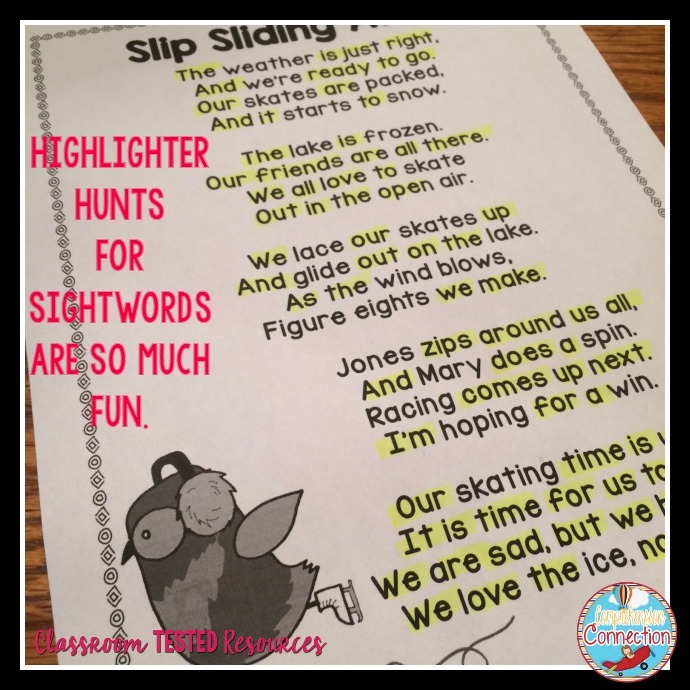 Another fluency builder is to address sight vocabulary. Have students box, underline, and highlight words you have practiced is fun. My students love working together to find them all or even racing each other in a gamelike competition. Poetry is also fun to turn into a song lyrics if you have the right poem. Recently, I used The Scarecrow's Job as a rap. 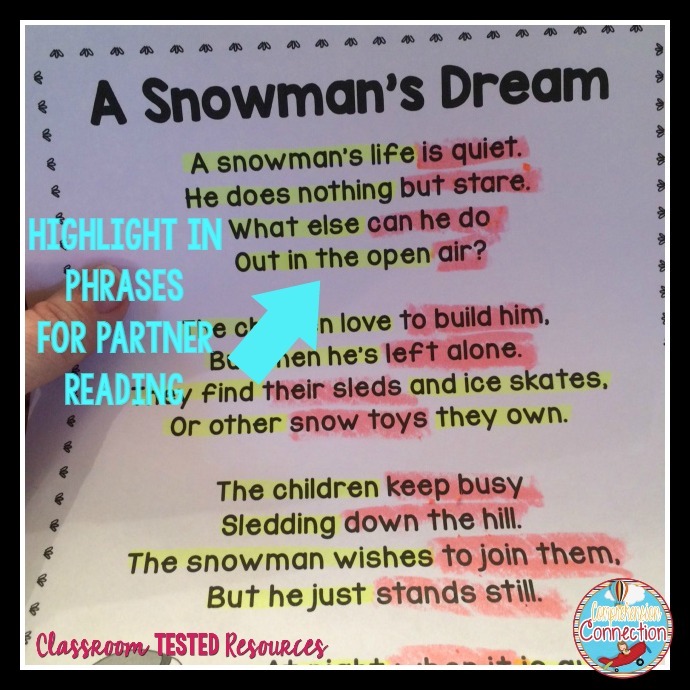 We sang and resang the poem in a fun playful way, and the students thought it was just great. They laughed and sang along. (and they thought their teacher was just crazy which I thought was hilarious!). Poetry is perfect for reviewing word study patterns. 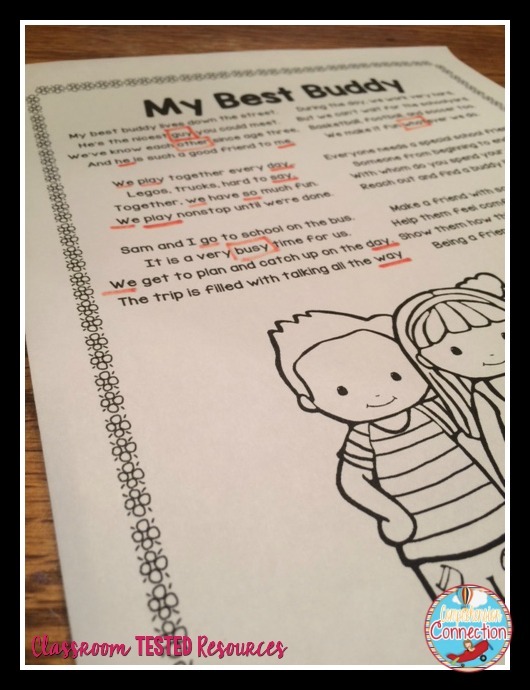 With a short text, students can scan through the poem quickly to locate words with the selected pattern (word hunts). Teachers can also use the poem as a way to model spelling patterns and pronunciations. Finally, comprehension of poetry is really important too. Every state reading assessment includes poetry, and students need to recognize that poems can tell stories, describe a beautiful scene, or make the reader laugh. 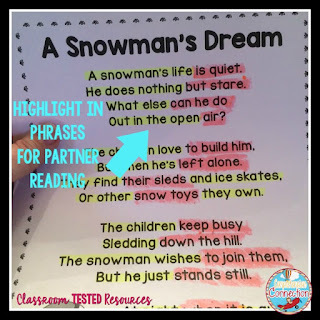 Using organizers or questioning with the poem helps students recognize that it's important to visualize the poem as they read and pull from the poem important details. 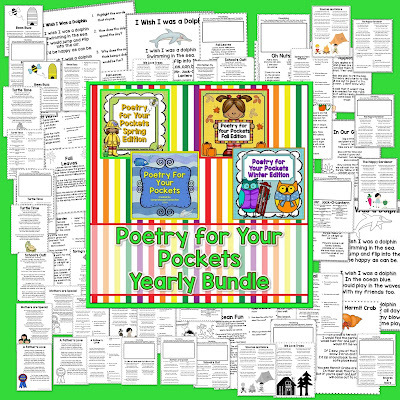 For Print and Go Poetry for your kiddos, check out my Poetry for Your Pockets Yearly Bundle. 37 original poems and supplementary materials are included so that all five activities shared can be easily implemented each week. Below, is a freebie you can try out. 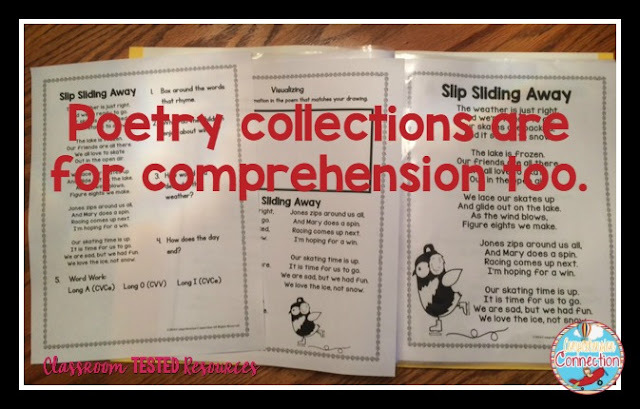 If you have students needing RTI intervention for any of these skills, the poems would make your intervention lessons easy to pull and teach too. For the full bundle, click below. Thanks for visiting today. Come back tomorrow to hear how Em from Curious Firsties uses graphic novels to fire up her readers.